Two disciples from Jesus’ inner circle make a request that irritates the others but allows Him to reveal one of His kingdom’s greatest mysteries. What is it? 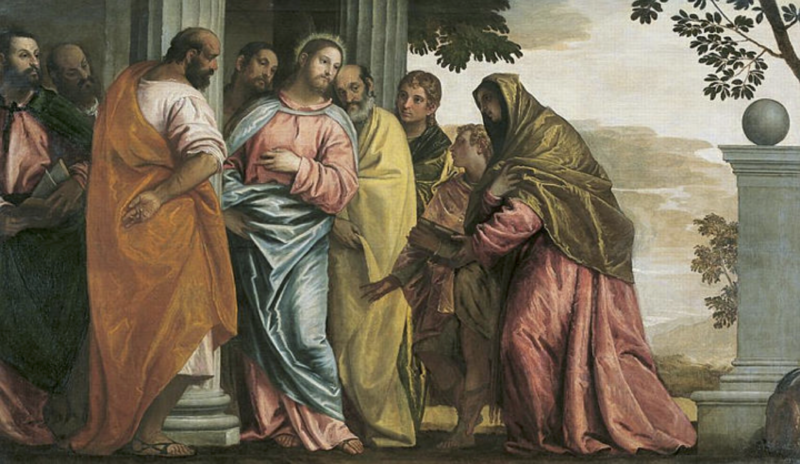 St. Mark tells us about a bold moment when James and John (two of Jesus’ closest friends, the other being Peter) ask “that in Your glory, we may sit one at Your right and the other at Your left.” Recall that in St. Matthew’s Gospel, their mother was with them, too (see Mt 20:20). It is interesting to watch Jesus respond to this request. First, He says, “You don’t know what you are asking.” Yet, surely James and John believe they do. Jesus asks of them: “Can you drink the cup that I drink or be baptized with the baptism with which I am baptized?” No hesitation! They immediately answer, “We can.” We need to understand that Jesus’ reference to drinking “the cup” is Old Testament imagery depicting the misery God compels the unfaithful to drink (see Ps 75:8; Isa 51:17; Jer 25:15). The “baptism” refers not to His water baptism (which had already happened) but to His immersion in trial and suffering. Jesus is describing for them the great battle that lies ahead for Him. By their question, we have some understanding of what kind of kingdom they think He is about to establish. Any good revolutionary is very ready to engage the battle that will usher in a new regime; James and John quickly count themselves prepared. Jesus accepts their profession of readiness, confirms it, and then shows how they really do not know what they are asking. It is true, Jesus tells them, that as His disciples they will enter into great suffering, just as He did. As it turned out, James was the first apostle to be martyred (see Acts 12:2), and John lived in exile (see Rev 1:9). However, here Jesus explains to them that greatness in His kingdom is received, not earned. Although the disciples boldly asserted themselves in their request for choice seats in the kingdom, Jesus Himself defers to the Father. In the glory of Jesus’ kingdom, it is “not my will but Thine be done.” Jesus knows this truth and lived it. Now, He uses a somewhat obnoxious moment (“when the ten heard this, they became indignant”) to teach His disciples to know and live it, too. Using man’s natural desire for greatness and the power that goes with it, which is implicit in the request by James and John, Jesus establishes the difference between the world’s way and the way of His kingdom: “Whoever wishes to be great among you will be your servant…the slave of all.” We can imagine how shocking this must have been to the two disciples who had tried to position themselves in advance for greatness. 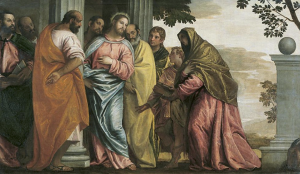 Then, Jesus gives them Himself as the living example of His words: “For the Son of Man did not come to be served but to serve and to give His life as a ransom for many.” The disciples could not have fully understood the meaning of this at the time, before the dying and rising of Jesus. In time, they would learn, and the sons of Zebedee would one day choose this path of humility, too. Possible response: Lord Jesus, help those who lead the Church be willing to find greatness in being servants of all. St. James and St. John know that now, and so do we. Possible response: Lord Jesus, thank You for paying the price for our rebellious insistence on our own greatness. In our Gospel, we saw misplaced human confidence. In Hebrews, we learn how to be confident in the right way. Possible response: Lord Jesus, I need Your mercy and grace to choose self-denial today. Every hour brings temptation to skirt the way of suffering.